Is there anything cozier than a wood-burning fireplace on a cold winter’s night? Maybe it’s what sold you on our current house. Or perhaps it’s a wish list item for the house you’d like to buy in 2019. Although fireplaces can be charming and cost-saving features, they do require regular maintenance to keep them working safely and efficiently. Here’s what you need to know. Don’t leave a fire unattended in your fireplace, especially when children are around. Open a window when using the fireplace to keep the room free from smoke. Use a screen in front of the fireplace to keep embers from landing on surfaces in the room. Use a fireproof hearth rug in front of your fireplace to ensure that it won’t catch on fire or melt if a spark or ember lands on it. If you have glass doors on your fireplace, be sure they are open when the fireplace is in use. It allows cool air to be drawn in and up the chimney. Use fireplace tools when handling burning logs or coals. Make sure you have a chimney cap to keep animals, debris, and water out of your chimney. Install smoke and carbon monoxide detectors throughout your home and make sure they always have fresh batteries. Only burn seasoned hardwood like birch, ash, maple and oak that has been dried under cover for at least six months. This wood burns long and hot and causes less creosote buildup. Green wood and soft woods will not burn as well and will create more creosote buildup. Removing ashes from the firebox when they become deeper than an inch. Wait at least three days before removing them, as coals can remain hot for that long. They should go directly in the trash, or they can be sprinkled on flowerbeds to add essential nutrients to your soil. Never vacuum the ashes and always wear a mask and gloves. 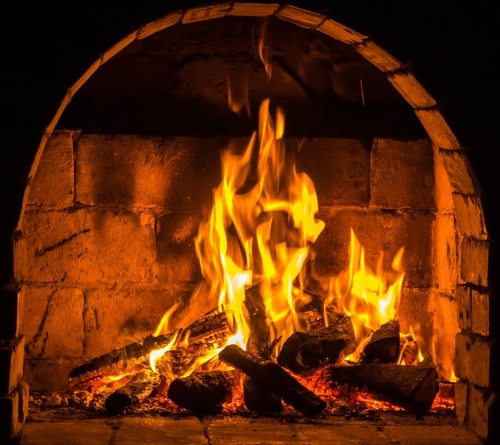 Monitoring your fireplace throughout the season for signs of creosote and soot If you notice more than 1/8 inch of buildup, you need to call in a professional to have it cleaned. Test your fireplace each time you make a fire by lighting a few small pieces of wood. Check to see if the smoke rises vertically up into the chimney. If not, check that the damper is open. If smoke still fills the room, have the chimney inspected and cleaned. Have your fireplace cleaned and inspected by a professional chimney sweep. A basic cleaning will cost anywhere from $150 to $350. This should be done every year at the end of the burning season, more often if you use your fireplace regularly. Inspect your chimney cap and repair or replace as necessary.